Big Muffin Serious Band (Musical group). This material has been copied by the Library of Victoria University of Wellington under Section 55(a)of the Copyright Act 1994, and approved for online publication with the following conditions. You may make a digital or print copy for your personal research and study use. You may not make copies of an image or part of an image for other persons, or distribute an image or part of an image to other persons by any means whatsoever including mounting the image on a server, without the written permission of Victoria University of Wellington and the copyright owner. You may not modify an image or incorporate an image or part of an image in another work without the written permission of Victoria University of Wellington and the copyright owner. You must include this copyright statement in any copy that you make. 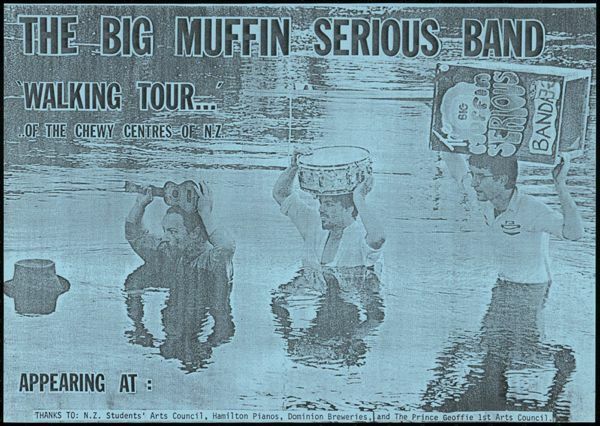 Poster advertising a tour by New Zealand alternative rock band The Big Muffin Serious Band. Includes a photograph of three men walking through deep water, carrying a ukelele, a snare drum and a tea-chest bass. Also includes the texts: 'Thanks to: N.Z. Students Arts Council, Hamilton Pianos, Dominion Breweries, and the Prince Geoffie 1st Arts Council.' Blue copy.